Greatest Movie Entrances: One of the most striking elements in any film is the sudden or memorable appearance of one of the main characters or stars. Often, film entrances are not very extraordinary, but now and again, there are some that are visually spectacular, attention-getting and skillfully executed. 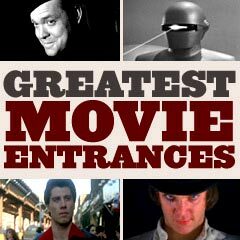 Although it would be impossible to compile a list of every single memorable movie entrance ever screened, this collection moves toward that goal. The following illustrated list, in unranked chronological order, presents a solid collection of the most classic film entrances or bows of film characters in cinematic history. These include film scenes from the silent era, the classic film period, and modern-day.